When police found an unconscious man at his home in an upscale neighborhood in Virginia, they also found a surprise: Several venomous creatures were among the 14 reptiles living there. Fairfax County police went to the home in the 4800 block of Walney Road in Chantilly shortly before 6:30 p.m. Wednesday, after a caller reported an unconscious man. Authorities took the man to the hospital, where his condition was deemed non-life threatening. While inside the house, police also found 14 reptiles, including several venomous snakes. 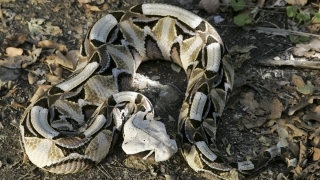 Among them were a Mojave rattlesnake and Gaboon viper, which can grow up to six feet long. Both are illegal to posses in Virginia. Animal Control and Luray Zoo employees removed all 14 reptiles from the house. The man's loss of consciousness is not believed to be connected to the animals in his house, police said in a release. The case is currently under investigation, and police say there is no threat to the public at this time.